A quick and easy Halloween craft perfect for ghouls and boys! Hey Creative Ramblings readers! I’m excited to be here with you today sharing a fun, easy and inexpensive Halloween craft. Before I had kids I wasn’t a huge fan of Halloween, probably because I was always working and didn’t really have the time (or really the want) to decorate. But this year my boys have been begging to start decorating for Halloween since the beginning of September. I have to admit, I wanted to start decorating then too but had to control myself because who starts decorating for Halloween on Labor Day?! Last week I couldn’t wait any longer and we started decorating our front porch. 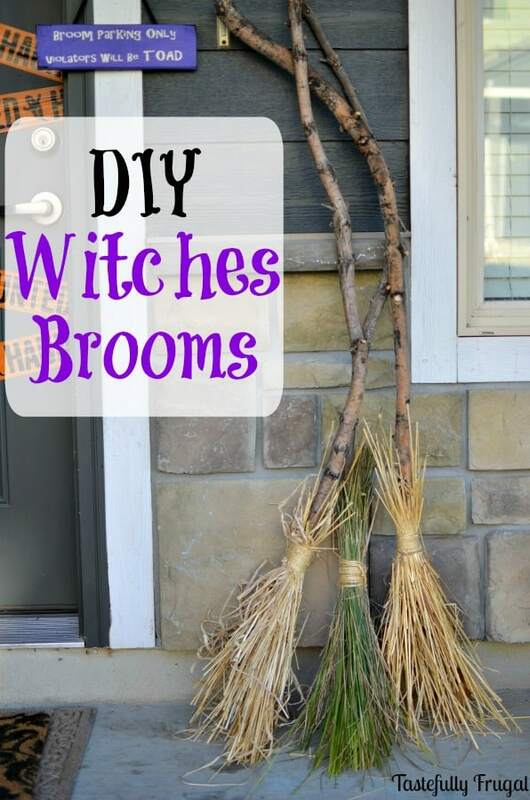 If you follow me over at Tastefully Frugal you may remember on Monday I shared our DIY Witches Brooms as part of The 13 Frightfully Fun Days of Halloween. 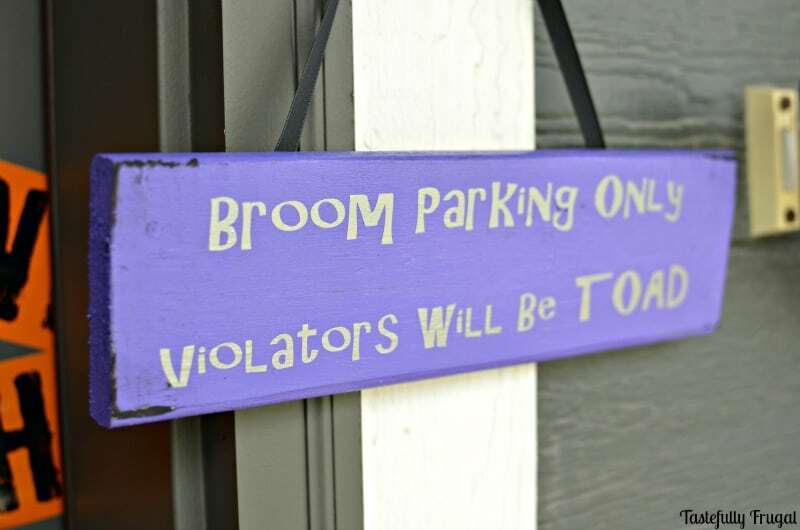 Today I want to share with you the tutorial for how to make the Broom Parking Only sign that goes with them. This is super easy to make and only takes about 10 minutes of work (not including paint dry time). 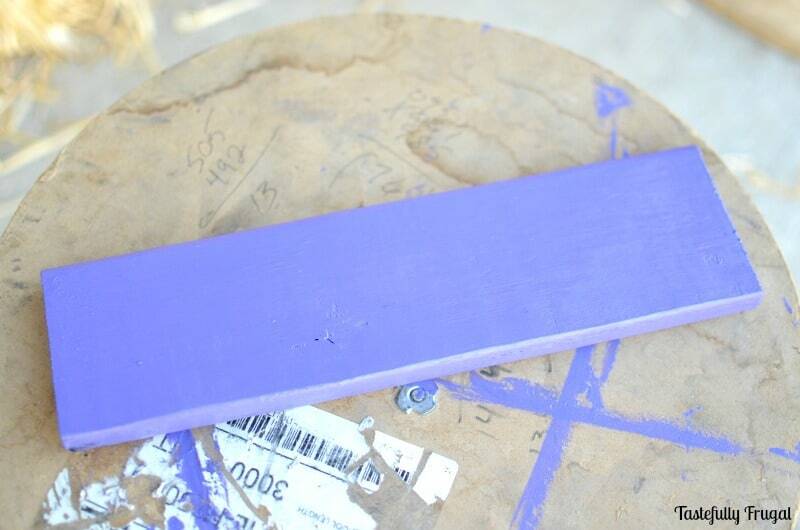 Paint front of wood and sides purple and let dry (for at least 1 hour). Paint the corners with black paint. I used my Cameo to cut the letters out of silver vinyl. I wanted to use the vinyl as a stencil originally and paint on the letters but after my Fall Banner Craft Fail I decided to just stick with using the vinyl letters. Cut a piece ribbon your desired length to hang sign (I cut mine 20″). 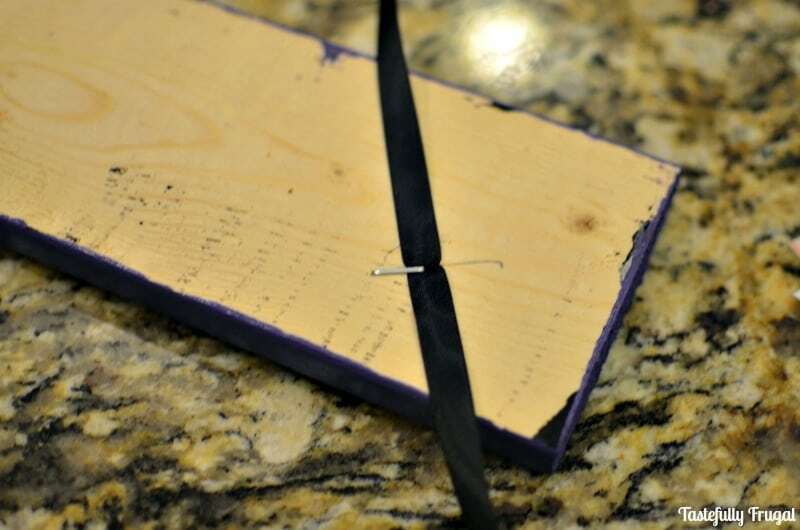 Using staple gun staple ribbon to back of the wood. We stapled once about 2 in. 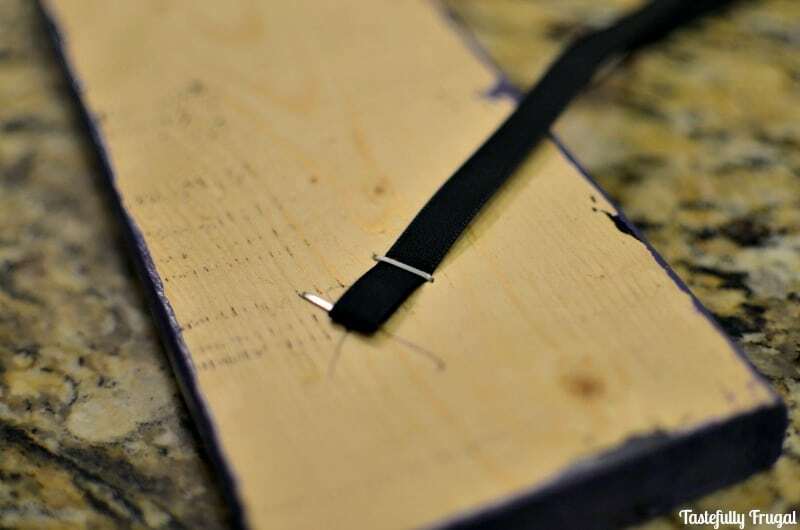 from the end of the ribbon and then turned the ribbon up and stapled it again to make sure it stuck. Turn your sign around and display. Easy peasy right?! 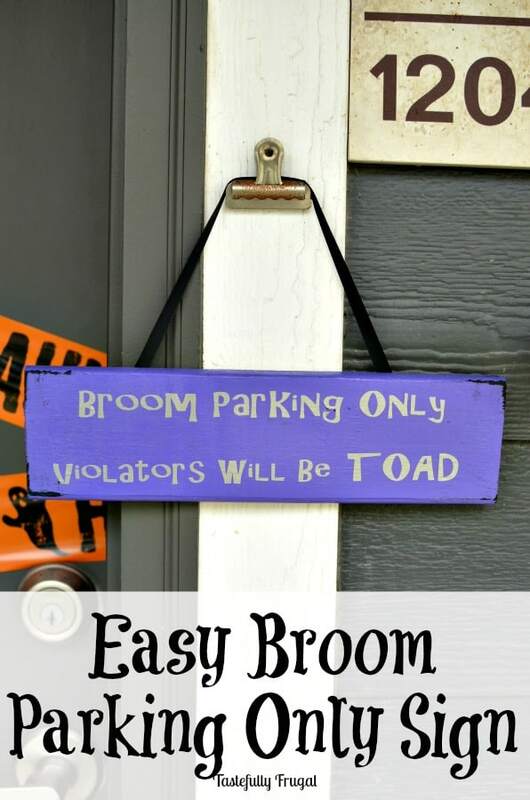 The brooms were easy to make as well and actually didn’t cost a dime since I had everything I needed for them in my house or back yard. 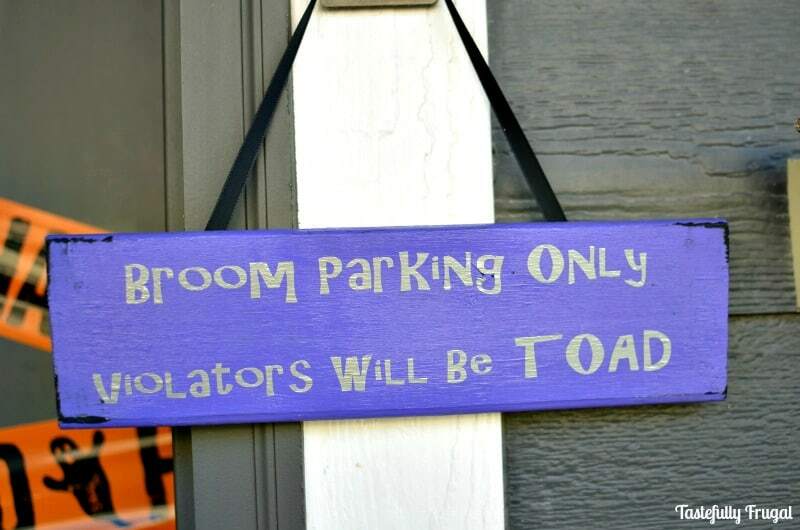 What’s your favorite part of the house to decorate for Halloween? If you are looking for more fun and frugal Halloween ideas follow me over on Instagram and Pinterest and be sure to check out the rest of the 13 Frightfully Fun Days of Halloween over on Tastefully Frugal.